Harding produced arguably his best performance of the season to thwart King’s Lynn Town in Saturday’s Evo-Stik League South clash. 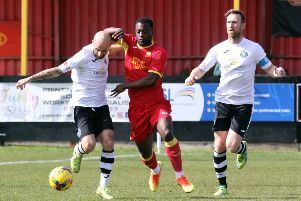 Now Ford says Harding, who has been his number one since he took at the Banbury Plant Hire Community Stadium, needs to assess where his career is heading. Harding missed the first nine games of the season because of injury, so Northampton Town keeper James Goff deputised. Harding returned before another injury saw Oxford United stopper Manny Agboola take over from October until January. Up to this season, Harding had been an ever-present and a reliable number one but it has been a challenging campaign for the ex-Ardley United keeper. But Harding was back to his best against King’s Lynn and Ford will hope he can maintain that level. Ford said: “It’s Jack’s career, not mine, and he needs to work out for next season how he can become a better keeper than he already is. But Jack has had a disrupted season through injuries, it’s been and up and down time for him.